Talk all you want about cautious business. Talk of men whose investment principles are built on economic research. Talk of the necessity of confidence for financial expansion. But uncross your fingers when you talk television. Commercial television receivers went on general sale in New York, and the National Broadcasting Companys transmitter atop the Empire State Building began its regular weekly broadcasts on May 30. The happenings of that day dissolved the myth that the sons of Uncle Sam are no longer gambling, fun-loving pioneers. For nearly 15 million dollars have gone into ten years of plant investment and snails pace experimentation. And a word from the Federal Communications Commission or a nose-wrinkling gesture by the public will send 15 millions of dollars down the drain. No more adventure in American money masters? Tommyrot. Fiddle-faddle. Look at the record of television. 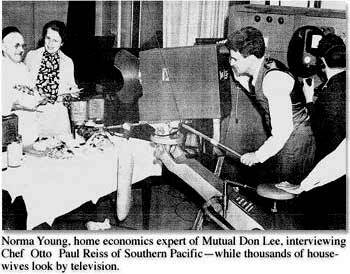 Since were Californians, lets look at the closest record: One of the oldest, most exciting and least publicized television storiesthat of the Don Lee Broadcasting System, with headquarters in Los Angeles. The story began back in 1926, when Mr. Don Lee, who had exclusive distribution rights in California for Cadillac automobiles, entered the broadcasting business by purchasing station KFRC in San Francisco. A year later he purchased KHJ in Los Angeles. With substantial talent organizations being maintained at both stations, Lee proceeded to furnish a greater diversity of entertainment by arranging full-time network-line installations between the two stations to allow interchange of programs. The McClatchy stations at Fresno, Stockton and Sacramento liked the arrangement, and acquired full-time line facilities in December of 1928. Less than a year later the transcontinental facilities of the Columbia Broadcasting System were extended to the Pacific Coast, and the Don Lee and McClatchy stations were invited to provide Columbias California outlets. Four other stations in Oregon and Washington were added to the Don Lee network. Under the arrangement with Columbia, the Lee system provided all the telephone lines between California stations and had a partnership arrangement with Columbia for their use in the Northwest. By 1930, then, the Don Lee Columbia network was a nine-station Pacific Coast hookup, releasing Don Lee commercial and sustaining coast network programs and also releasing Columbia transcontinental commercial and sustaining programs. The investment was not large, but the income from broadcasting and automobiles was good, and Don Lees curiosity was strong. He had investigated television; he realized its ultimate importance; he desired to earn a first rank position in the Pacific Coast field. Late in 1930 he set out to make expenditures for television research work. By now the Don Lee Broadcasting System can afford, all by itself, the expenditures that are being made for television. Don Lee himself died in 1934, but the product of his handwork is still growing. Its now a 31-station network affiliated with Mutual instead of Columbia. Four of the stations are owned outright by the system. The president andby Don Lees willsole stockholder of the system is Thomas S. Lee, his son. And the most important by-product is W6XAO, a television transmitting station in Los Angeles. In November, 1930, Don Lee engaged the services of 24-year-old Harry R. Lubcke, B.S., University of California, an electrical engineer, and gave him the title of Director of Television of the Don Lee Broadcasting System. From that time on, the Don Lee outfits remarkable progress in television has been due to a combination of young Harry Lubckes inventive genius, the business acumen and daring financial spade-work of the Lees, and the careful supervision of dynamic General Manager Lewis Allen Weiss. Together with Vice-President Willett H. Brown and Sales Manager Thayer Ridgway, they form one of the most forward-looking radio and television promotional teams in the nation. The license for establishment of the W6XAO transmitter was granted in June, 1931, five months after it had been applied for. Regularly scheduled telecasting was started by the station more than eight years earlier than by the NBC New York transmitter. On December 23, 1931, W6XAO went on the air from the eighth-floor transmitter at Seventh and Bixel streets, Los Angeles, at 44 1/2 megacycles, to broadcast one hour daily except Sundays. In order to provide listeners, or lookers, Lubcke prepared and distributed plans for construction of receiving sets to many amateurs in the area of Los Angeles. Early in the game, something like a hundred people built teleceivers from Lubckes plans. As compared with this years estimated figures of radio listeners to the stations of the Don Lee network8,000,000 in 2,000,000 homesthe most optimistic guess concerning W6XAOs customers is something like 1500 in not many hundreds of homes. Since sets will not be marketed commercially in Los Angeles for several months yet, all of these were built by the lookers for themselves or for interested purchasers, at a cost of about $200 each. Satisfactory images and good reception are being regularly recorded by Don Lees audience of amateurs in a radius of 30 miles from the station. The 30-mile limitation is not the fault of weak transmission, but merely due to the ultra-high-frequency television beams habit of traveling straight forward, like a rifle shot ungoverned by gravityon and on out into space. The eighth-floor transmitter sends images only as far as a man can see from an eighth-floor window, and not beyond the earths curvature. This also means that the images do not go into North Hollywoods canyons nor down to the foot of Santa Monicas palisades, television beams do not circle around obstructions as radio beams do. But those Los Angeles lookers who are so located as to receive the W6XAO signals are fortunate enough to have been able to watch the experimental development of numerous Lubcke inventions which, appearing so early, have proved to be broad and basic improvements. These improvements in all phases of television have resulted in many United States and foreign patents in the names of Lubcke and Don Lee, certain of which have been sold to RCA, with the license to use them retained. The underlying principles of these inventions were proved thus in May, 1932, when a cathode-ray type television receiver developed by Lubcke and his staff was taken aloft in an airplane for the first time in history. Images sent out from the Don Lee transmitter were seen by press representatives in planes over Los Angeles. One of the objectives of the flight was to prove that the Lubcke teleceiver was operable when connected to other than city power lines. Before this development, a power line common to both sender and receiver had been used to accomplish television synchronization. Reception in an airplane was a dramatic, press-inspired manner of verifying the absence of any power-line synchronizing. One implication was that inter-city cathode-ray reception of ultra-high frequency waves is practical. Another pace-setting development in the Pacific Coasts march of television was the lacing in operation of the United States largest completely successful cathode-ray teleceiver tubesthe screen on which images are received is the flat end of the cathode-ray tube. The new tubes, costing $75 to make, weigh about six pounds each, operate on 6000 volts, and yield clear images 14 inches square. Their large success and small publicity is indicative of the importance of the Lubcke staffs brilliant but secret experiments. Although Don Lee television developments employ patented methods and devices for producing and receiving images, they are exactly according to national standards agreed upon by all television industry factors. Its nothing more than an optical illusion. At any fraction of an instant, all there actually is to look at is one tiny pin point of light of varying intensity. But it travels so fast that you seem to see an entire picture. For that matter, movies are an optical illusion, too; you see a number of still pictures in such rapid succession that the characters appear to be moving. Thus, at first, adequate images were received from W6XAO when the pin point took 300 trips across the screen and popped back to the beginning twenty-four times every second. Recently the station installed a 441-line, thirty-times-a-second scanner, and now furnishes extremely well-defined or high-definition images. The first public demonstration of these images was made at the Don Lee Broadcasting System headquarters in June of 1936. During that month W6XAO was on the air four hours daily, and 5,000 persons attended the free demonstration. To date the station has transmitted 11,000,000 feet of motion picture film. The production and transmission of live talent programs started in April, 1938, after a year of preparation. At present the six-day weekly schedule of W6XAO consists of live talent four nights and film two nights. films are mainly newsreels and educational features. Although many observers predict great program developments once television receivers are extensively placed in homes, Thomas S. Lee has his own ideas about it. He thinks the type and variety of programs his station has been putting on are pretty much what will hang on. 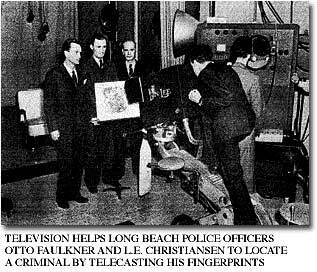 Besides outstanding newsreelsamong which he numbers the reel concerning the big Long Beach earthquake, which W6XAO transmitted a couple of days after the occurrencetelevision stations have developed mobile camera units which can follow police calls and sports pages to transmit spot news as it occurs. As for films, there seems to be some doubt that movie makers will allow their features, which cost thousands of dollars per running minute to produce, to be shown gratis at home to otherwise potential paying patrons. The movie men are in a hotter spot than they were when talkies first proved popular. Some have protected their investment by further investing in television companiesnot, however, in the Don Lee enterprise; the Lee investment in time, labor, materials and equipment runs into hundreds of thousands of dollars, and no outside capital has been solicited or accepted. The big chance for films in televisions vague but starry future appears to be sponsored short subjects, such as those now produced by various manufacturers, the Federal Government and large retail corporations. Sponsored by private advertisers and incorporating genuine entertainment factors, they could be made to pay outin entertainment value for lookers; in public relations and advertising value for sponsors; and in toll charges for transmitters, since the problem of television networks seems financially unsolvable. It is in live-subject transmission that Thomas Lees experience and opinions seem most important. One of the many firsts in the Lee stations work was the recent application of television to criminological work. Flashing over the video-sound lanes from W6XAO in Los Angeles, prints of a hypothetical criminals fingers were viewed on a teleceiver by police officers many miles away and identification made almost instantly from suspect files. The fingerprints were also seen by lookers in all parts of Los Angeles County as part of the regular W6XAO educational program. Tommy Lee expressed the belief that some day scientists will enable police to flash fingerprints to the Department of Justice at Washington a few moments after discovery of a crime; the comparison of information would require less than five minutes. Lee has been quick to see the educational and entertainment possibilities of television. The oldest continuous dramatic television serial is W6XAOs Vine Street, broadcast in 15-minute episodes twice a week for twenty-five weeks now. Its a part of Tommy Lees broad program designed to make television contribute toward a richer and happier life at work and play. In a recent interview he explained what the final result of his educational theories would probably be. Sitting beside the teleceiver in her own living room, the housewife can duplicate every movement of a famous dressmaker in cutting the pattern of a fashionable garment. She can learn to prepare a new dinner dish; she can learn how to select economical cuts of meat; she can learn how to redecorate her home. junior can learn the fingerings on his saxophone; the younger children, after supper, can do their school homework by watching a tutor. Many men will learn how to break a hundred on the golf course; and there are always subjects of studio demonstration-interview type such as pipes, horses, shooting, stamp collecting and bowling. With production technique satisfactorily abreast of the latest international developments, owner Lee has not rested. His organization has taken three steps within the past few months to place it in the forefront of the field. First, he has bought a 20-acre site on a mountain top at the eastern boundary of Griffith Park, widening the transmission field of the Don Lee equipment to take in new thousands of homes in the Hollywood hills and the San Fernando Valley. The site is one and a half times higher than the top floor of the Empire State Building in New York. Mount Lee is thus the highest television location in the world. The transmitter is being rebuilt for installation on the mountain. The second step in the Lee expansion program was the filing of an application with the FCC for a license to telecast in the San Francisco area. Although no information has been given out as to the site of the new Don Lee station, it is known that the equipment will be a one-kilowatt sight-sound transmitter serving San Francisco, Oakland, Alameda, Berkeley, Richmond, San Leandro, Hayward, Burlingame, Redwood City, San Mateo, Palo Alto and Marin County. Programs will follow the Los Angeles pattern and will include talent from the San Francisco-Don Lee radio staff. Third, and most promising of all developments for the Don Lee television interests, was the recent step taken by the government to include the organization in a national television standardization conference. General Manager Weiss and Television Director Lubcke left May 8 for Washington in answer to a telegraphed invitation from FCC Chairman T. A. M. Craven. While in the East, the two also inspected other television plants in New York, New Jersey and Connecticut, and Lubcke has devoted some time in Washington to patent matters. We believe this is the go signal, that the United States is on the threshold of one of the greatest scientific and social advances since the advent of the radio and talking film, Weiss said before he left. By now, with six weeks of conferring behind them, the two Don Lee officials are agreed that after nine years of motor-tuning behind them their organization is ready to beat everybody on the pick-up when the light does shine green.